Twice recognized as the Heritage of the World by UNESCO, Halong Bay proved that its endless charms did not be faded through time. This land make impress in a vast nature painting of limestone tops arrays stretching along with thousands islands and islets. Experiencing the accretion of locally colorful history. Halong Bay was put add on itself the unique culture charms beside of the rustic and honest of resident heart. 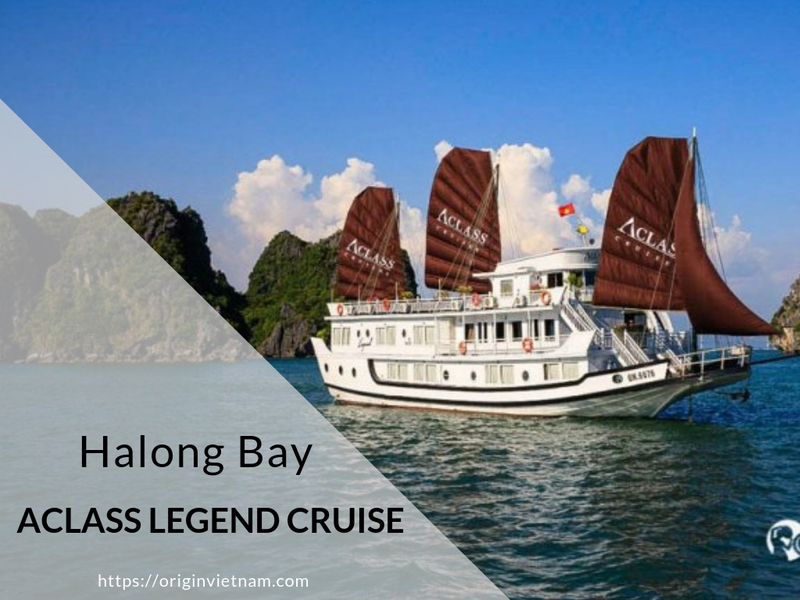 The Aclass Legend is the worthy choice for anyone looking for a perfect plan in average range Halong bay tour cost. This cruise offers you a quiet and peaceful atmosphere in graceful wooden space. With 14 luxury guest rooms, suites and public areas are full of well-equipped with modern amenities and large window. Your life is absolutely comfort as home and get attend to magnificent panoramic of Halong Bay with all most amazing moments of time. Welcoming you at the entrance of Aclass Legend Cruise is the well-trained crews and a highlighted oriental style. Your vacation will be a truly unique and unforgettable experience when companioned by the most elite values of Vietnam culture. 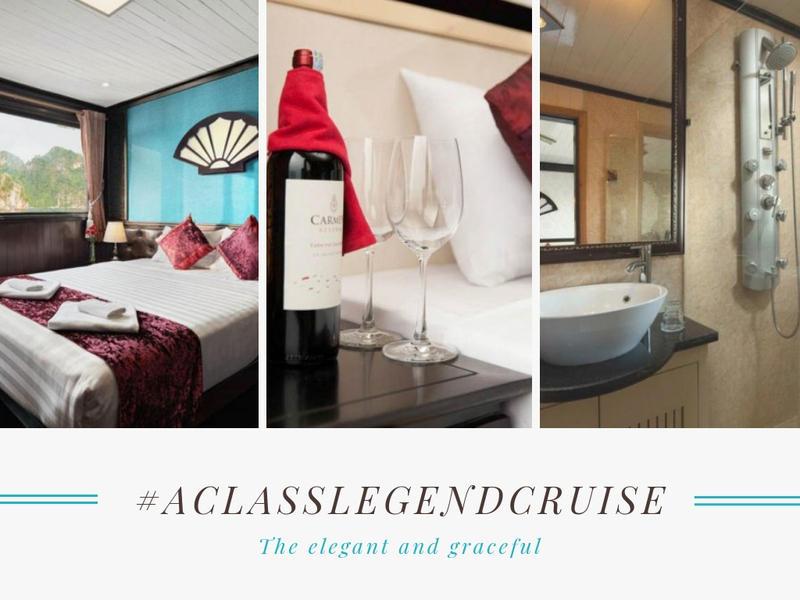 Aclass Legend cabins were separated into three main standards, suitable with all your wishes on own dreaming accommodation. The deluxe is the spacious and bright space highlighted by large window opening panoramic sea view. Along with the elegant and nostalgic Indochina decor will absolutely satisfied your art-love eyes. The room also equipped full with modern amenities for a maximum comforts in the daily needs of customer. The Premium cabin located on the second deck is in other convenient condition when same deck with dining room and bar. You can get best room services (with favorite foods and drinks) in any time you’d love. Air-conditioner, safety box, en-suite marble bathroom with hot shower cubicle and most of others high quality furnishings in sunny-flooded and more extensive space is what you got in whole journey. And Suite cabin is heaven for families or small groups with the two linking rooms and en-suite balcony. Your journey will have no any regret in the large sized tasteful room along with the number-one luxury facilities in here. And the high end glass windows arrays help you catch completely the magnificent Halong in a frame. A fresh fruit platter, one Chile wine bottle from the hospitality of Aclass Legend Cruise will make your day on point. The dining room highlighted by precious wood engraving art will serve guests private tables, comfortable and romantic candle-meals in the unparalleled beauty of the bay. Beside of that, the cozy bar with delicious cocktails, beer, spirits and fine wines...will fill your days with perfect flavors. What make your dream journey? That is local foods, attractions, entertaining activities or accommodations? 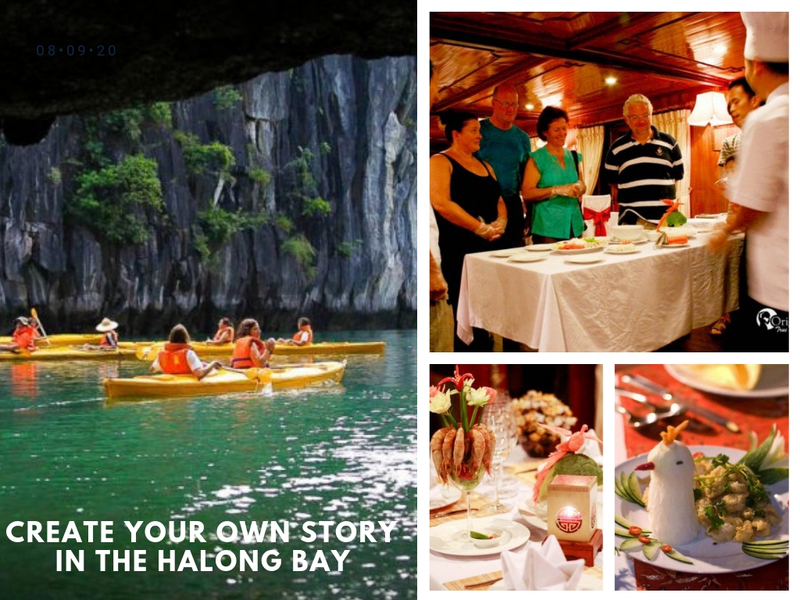 At Aclass Legend Cruise in Halong Bay, you will enjoy your story with all sides as your wish. With the enthusiastic and extensive knowledge chef team. You will be served all the most delicious menus in local and international cuisine. Specially, the ingredients always are ensured in fresh and hygienic and meticulously selected by honest local farmer hands. You also can join in the cooking class with chef right on boat, exploring the magical process to make the worldly famous dishes of this country. With the experienced tour guides, you will get more deep insights about the nature and local life here. On the kayaking and bamboo boats tours floating along the emerald water lane. You have chance to go inside the majestic populations of Halong stalactites caves with destinations. Such as: Surprising Cave, Maze Cave, Luon Cave...Your films will continue with the dramatic scenes in Ti Top island. It's located in middle of pure water land, blue sky and white sands. Or other exciting sea activities as: scuba diving or even trekking to highest mountain to conquer the most beautiful sight of Halong. Do not forget the time on Cua Van floating village or Halong Pearl Farm. Where you will know how the people here so excellent and what make them brighten in the challenges of difficult living conditions of this land. And with the warmest attitude of staff, your night life will full fantastic entertaining activities. Such as: outdoor parties, games, movies, and squid fishing...You will revel on your sweet moments in this journey. With the values exceeding expectations. Aclass Legend Cruise one of the top recommendation cruise in Halong Bay. “The rightest choice for amazing journey” Someone on TripAdvisor said that. To get more other information about this cruise or similar choice in mid-range budget. Let connect Origin Vietnam at website: https://originvietnam.com. Your stories will begin with the honest and thoughtfulness.